Are You A Yo-Yo Debtor, Too? By Melissa 4 Comments - The content of this website often contains affiliate links and I may be compensated if you buy through those links (at no cost to you!). Learn more about how we make money. Last edited March 25, 2014 . What I don't share as openly is that we've been yo-yo debtors for most of our marriage. We're just like yo-yo dieters who limit their food intake and lose a hundred pounds only to loosen the reins when they reach their goal and turn around and gain back all the weight and then some. When we first married, we had about $30,000 in my student loan and credit card debt. My husband was in school full-time, and I was working for about $35,000 a year in a high cost of income area. We spent carefully because we had no extra money to spare. Five years later, by the time our first child was a year old, we had paid off the credit cards, but then we had a hefty car loan and still had my student loans. However, for the first time in our marriage, we were making decent money. My husband was working as a graduate assistant, and thanks to doing extra work and getting raises at work, my salary had increased quite a bit. We worked hard to pay off our $25,000 car loan in 3.5 years instead of 5. We set aside some money for our emergency fund. But we never saved the way we should have. Instead, just like a yo-yo dieter, after years of deprivation, we splurged frequently on meals out, cable tv, and clothes and toys for our son. We were squandering what God had given us, and we didn't even realize it. Had we saved during those four years of income surplus, we likely wouldn't have gone further into debt when we had two more kids 17 months apart and I quit my job. But because we had squandered the money, we had very little cushion, and once again, we found ourselves making very little income. My husband took out student loans to finish his Ph.D. and for us to live on, I was still paying my student loan off, and we went into credit card debt because we were still spending like we did when we had a good income. Now, for the last 2.5 years, we've been paying down debt as aggressively as we can on our limited, but growing, income. Unlike times before, this time our debt repayment is different. Rather than thinking of this time as a temporary time of cost cutting, we understand that if we are to get ahead, we need to live like this permanently. and buying used for as many things as we can. In another year or two when my husband completes his post-doc and gets a job in his career field, we expect a nice jump in income. What we don't anticipate (or even hope for like we used to) is a bump in spending. Instead, the extra money will go to paying off the last of our debt and funding a bigger emergency fund and growing our retirement money. It's taken us 14 long years to learn how to live within our means and get off the yo-yo debting cycle. However, I'm confident that this journey to pay off debt will be our last one. I'm also confident that unlike the time of bounty previously, this time when we enjoy a greater income, we'll be better stewards of the money. 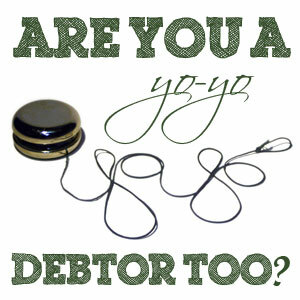 Are you a recovering yo-yo debtor, or do you know someone who is? 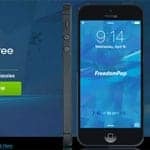 FreedomPop Cell Service Now Has Iphone 5 Available: Free Cell Phone Service With Iphone! Last Edited: 25th March 2014 The content of biblemoneymatters.com is for general information purposes only and does not constitute professional advice. Visitors to biblemoneymatters.com should not act upon the content or information without first seeking appropriate professional advice. In accordance with the latest FTC guidelines, we declare that we have a financial relationship with every company mentioned on this site. Thanks for sharing that Melissa! 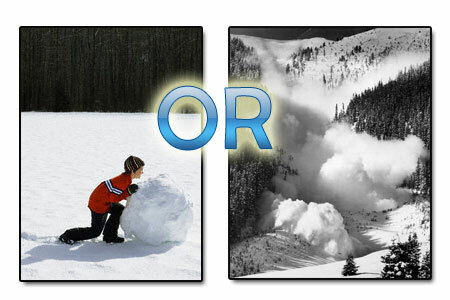 I see the yo-yo-e-ness happen in many areas of life. We do good one minute and not the next. The big key for me in breaking the cycle was to build a huge emergency fund and then also save over time for big purchases. By the time we are ready to purchase a new car this coming fall we will have been saving for two+ years. It will be great to pay for that in cash! We just rid ourselves of 109,000 of credit card debt, and we’re not going back..no yoyo debt for us! Thanks for sharing Melissa. I’ve not dealt with this in regards to debt, but have in other areas of life so I can empathize. The key for us was finding ways to break that cycle and keeping ourselves accountable to it. It’s not always easy, but by the second time around I found that we wanted it so much more that we did all we could to do attain whatever it was.